Bubby and Bean ::: Living Creatively: GIVEAWAY // Win a $100 Gift Card to Poppin! 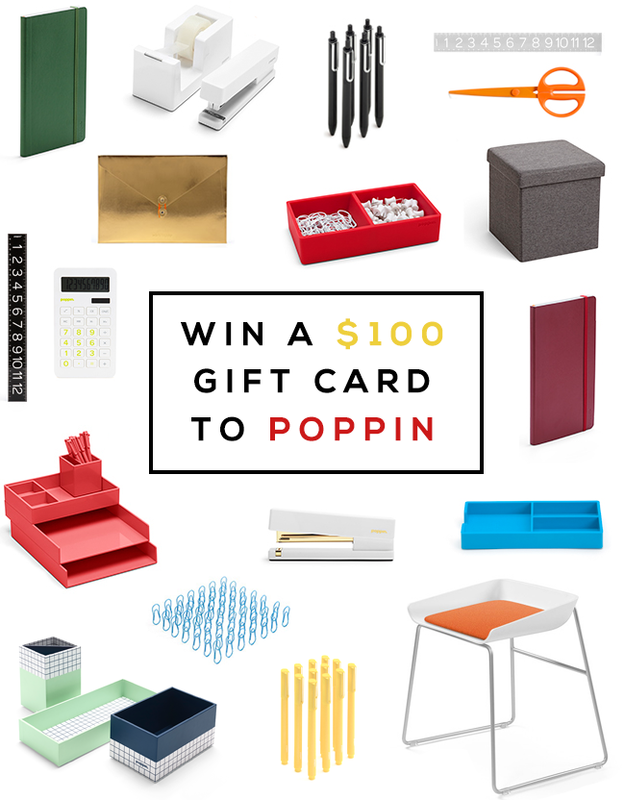 GIVEAWAY // Win a $100 Gift Card to Poppin! September is just two weeks away (man, that was fast, right? ), which means it's time to get focused on fall organization. Whether you're in need of some great back to school supplies or you're looking to get your office or work space in order with some seriously stylish accessories, our pals at Poppin have got you covered! They're truly one of my favorite brands, and I'm so excited to be teaming up with them today for a special giveaway that I know all of you fellow color lovers will appreciate. You've likely seen me gush about Poppin before, both here on the blog and over on my Instagram. I use their vibrant notebooks for everything from blog planning to grocery lists, and my workspace is filled with their colorful desk accessories. I'm a huge fan of their Desk Sets (perfect for getting organized), and I've got their dark gray Box Seat on my fall office wish list. I'm also really excited about their new metallics (especially the gold - gorgeous! ), and their new crimson and hunter green notebooks. And now for the best part! In honor of autumn organization, Poppin is giving one lucky Bubby and Bean reader the chance to go shopping on their website and pick out $100 worth of goodies to transform your work space, school space, or home! This giveaway will run through August 19, 2015 and is open to Bubby and Bean readers worldwide. A winner will be randomly chosen shortly after the end of the giveaway and announced here. Big thanks to everyone over at Poppin for giving our readers the chance to win such a fantastic prize! Good luck! My favorite item is the red desk sets. Thanks for the chance!! The white and light gray file cabinet brings some color but allows for sofistication as well! Love it! I love that gold/white stapler! Navy Medium Soft Cover Notebook with Gold Initial is just a fabulous item. oh my gosh I NEED TO WIN THIS!!! so cute! i would love the yellow bits and bobs tray! Their items are just adorable! In particular, I like their file boxes such as the Aqua Checka Paperboard File Box. Love the red desk set. Love love looooved the paper cover metallic notebooks (set of 3), so handy and chic!! Loving the turquoise but really enjoy the metallics this fall. I am so in love with all the colors they produce! So hard to choose! But, I'm in the market for a pen pouch so I'm going with the Pencil Pouch in Gold. I adore Red Writing Partners. I love the Pink Double Tray. I love the super stacked desk set in red -- but I also love mint. composition notebooks and some pens. I really need a computer chair so I love the Gray Qivi Desk Chair! I love the White Starter Set! Definitely this! I'm loving the polka dot pattern. RE: OMG, my fave: White Starter Set. Divine. Wow, prize $100 gc is fab. & splendid. 2 fingers snap. It is tight, fly & off the chain. Thank you for the awesomeness, the contest, and generosity. :) Pick me, pick me! I love the mint letter trays! I like the Red Box Seat. Favourite item at this stage may well and truly be the Lime Green Dream Desk Set - really nice! I love the Dark Gray Box Seat! I love the white filing cabinet! I like Pencil Pouch in Gold. Thanks. Lubka K.
I really love how you can view all the Poppin products by color!! I love the pastel desk organizers!